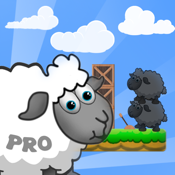 With Clone Sheep a completely new game idea is now available in the App Store. It combines skillfulness- , jump and run- and puzzle game in one. Dolly wants to explore the world. Use its unique ability to clone itself and help Dolly to get over tricky obstacles and gaps with its tireless clone army. But don’t waste too much time with cloning in to order to get as much points and stars as possible. If you are looking for a combination between adventure, action, puzzle and mental exercise Clone Sheep is the right choice. - A sheep you definitely have to love.